Peaceworks: We Say “No!” to Regime Change in Venezuela. We Say “No!” to Regime Change in Venezuela. As we prepare to post this it seems the campaign to unseat the government of Venezuela is intensifying. We urge all reading this to speak out now. Contact Congress and the White House. Write letters to the editor. Join in weekly peace demonstrations held locally Wednesdays, 4:30-5:30 p.m. and Saturdays, 10-11 a.m. Contact Peaceworks for more info. Today we in the United States find ourselves in a challenging political moment. The Trump administration is threatened, with many of Trump’s closest allies ensnarled in legal trouble, and his administration facing one embarrassing defeat after another, from the 2018 midterms to the unpopular shutdown. The President’s strategy seems to be one of distracting public attention from his failings, even if it means doing something that will have terrible consequences, for our country and/or others. It seems that this plays in to the decision to put regime change in Venezuela front and center at the moment, something that delights Neo-Cons like National Security Advisor John Bolton, even though this risks pushing that nation into a bloody and destructive civil war. Right at the get-go we want to make it clear that Peaceworks is not offering a blanket endorsement of the current Venezuelan government’s actions, some of which are troubling. Rather, we are sharing our thinking as to what is appropriate for our government to be doing right now. First and foremost, it is clear that pushing for the overthrow of that nation’s government is not a legitimate use of our government’s economic, political or military power. Moreover, it is likely to cause serious harm to the Venezuelan people, and have adverse consequences for us as well. While interventions—overt and covert alike—by our government are quite familiar do we not have to stop and ask ourselves, “Is this justifiable?” Clearly, there are times when some form of international action is called for. The Rwandan genocide is a good example. But such an action should be undertaken only in extreme circumstances and with the blessings of the United Nations, not unilateral action by the United States. Some might object and say “Maduro’s government is repressive.” Perhaps so, but how many repressive governments are there in this world? And how many of these are U.S. allies and client states? And, if it’s legitimate to attempt to take out Venezuela’s government on these grounds, how many governments might be targeted for replacement, and what else is legitimate? Should the U.S. unseat a government that uses the death penalty, which many recognize as a human rights violation? What about one that harms the environment? This is clearly a slippery slope. And, as many of us right now are rather unhappy over Russia’s alleged interference in U.S. and other elections, how do we square opposition to their electoral intervention here and support for U.S. involvement in the process whereby other nations choose their leaders? 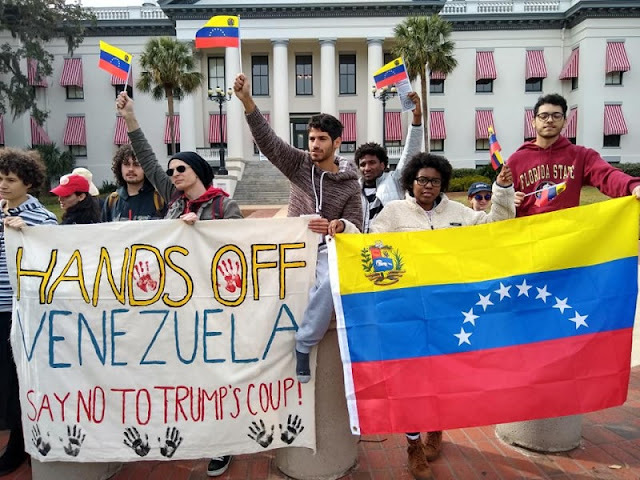 One factor that is fairly consistently overlooked is the twenty-plus year history of our government attempting to undermine Venezuela’s Bolivarian Revolution. The U.S. has consistently been in cahoots with the Venezuelan opposition. Washington has supported coup attempts and helped fund opposition parties. It has also used sanctions as a means of economic warfare. The CIA has been involved in several Venezuelan coup attempts, including it seems the current one. Juan Guaido’s attempt to seize power is just the latest in a string of attempts to remove Hugo Chavez or his successor Maduro. The main difference is that this time the U.S. role is blatantly overt, with Trump himself actively and publicly encouraging this violation of Venezuelan and international law. While the current push to unseat President Maduro was launched in January, the U.S.’s economic attack on Venezuela has been going on for years. Beyond simply opposing the actions of any state that refuses to accept the neo-liberal economic model, and the fear that any state succeeding in steering an independent course could set an example that might be emulated by others, the U.S., in this case, apparently has another, all-too-familiar motive. Venezuela has, depending upon how they are measured, the largest, or one of the largest, inventories of proven petroleum reserves in the world. The Trump administration would like to see U.S.-based companies take charge of developing and marketing these dirty fuels. We all know the Trump has basically zero respect for the truth and that, when it comes to U.S. interventions around the world, our whole government has a habit of telling those Big Lies over and over again. It is no surprise, therefore, to hear prominent Neo-Con Elliott Abrams, who has been made Trump's point-person on Venezuela, talking about “U.S. efforts to restore Democracy in Venezuela,” and apparently doing so with a straight face. On the other hand, some analysts do seem to get it right. 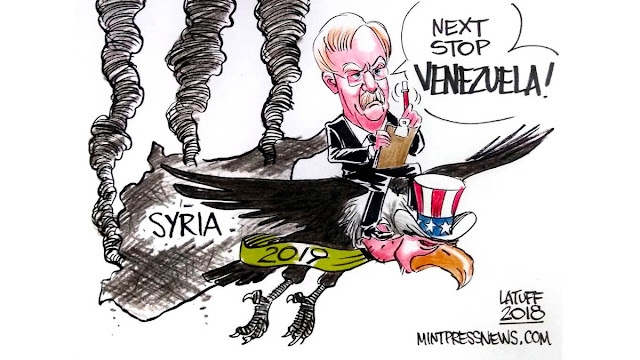 On January 30, former UN special rapporteur Alfred de Zayas tweeted: “The disinformation campaign about Venezuela is reminiscent of the weapons of mass destruction in Iraq 2003.” Seems to us like he’s got that right. While the administration’s plan of attack is unclear, whether that includes overt U.S. military intervention, covert actions, or just the use of proxies, it is clear that the stakes are quite high. First and foremost millions of Venezuelan citizens are in harm’s way. They are already suffering due to the ongoing economic warfare and, if this comes to actual hostilities, with bullets and bombs flying, many innocent people may lose their lives. Moreover, if the Venezuelan people lose the ability to choose their own future, this is problematic not just for them, but for others around the world, as it would set an example and encourage similar actions in the future. For all these reasons and more, we urge you to join Peaceworks in opposing our government’s actions aimed at regime change in Venezuela. The time to make our voices heard is now.